Replace the lies that bind you with the truth that sets you free. Now available at your favorite book retailer! You wouldn’t talk that way to anyone else, yet phrases like these constantly flow through your mind. Your self-talk has left you feeling insecure and defeated. 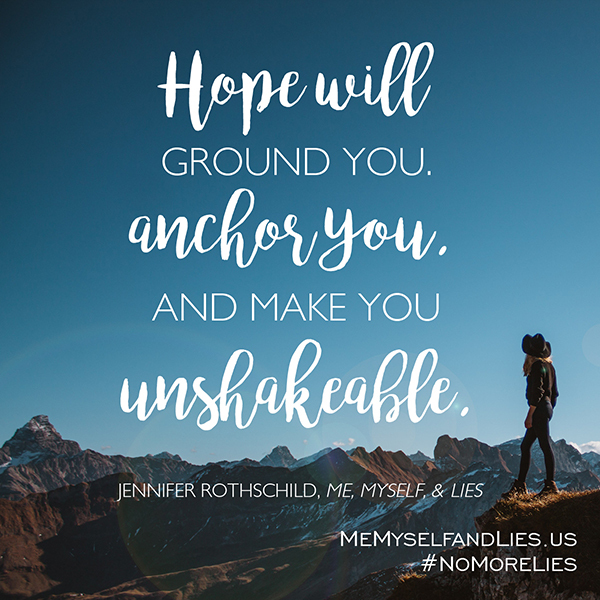 Jennifer Rothschild has been there, too – that’s why she has updated her popular book, Self Talk, Soul Talk, and is releasing it again as Me, Myself & Lies. In this newly revised edition, you will experience true freedom as you learn how to replace lies with biblical truth. 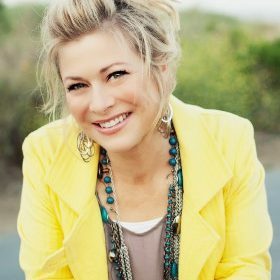 Jennifer Rothschild is an author and speaker who has written 14 books, including bestseller Lessons I Learned in the Dark and Bible studies such as, Hosea: Unfailing Love Changes Everything. 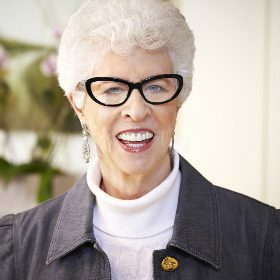 She’s been featured on Good Morning America, The Dr. Phil Show, Women of Faith and Women of Joy and is the founder of Fresh Grounded Faith events. 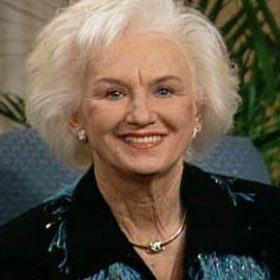 Jennifer and her husband, whom she affectionately calls “her very own Dr. Phil,” have 2 sons and an incredible daughter-in-law. She is a CS Lewis junkie who enjoys strong coffee, dark chocolate, great conversation, international travel and audio books. Jennifer became blind at age fifteen and now helps others live beyond limits. FREE video series with Jennifer! This is where you’ll find all of the “extras” mentioned by Jennifer at the end of each chapter of Me, Myself & Lies. Imagine the impact of a teen girl learning how to replace the lies that she is not smart enough or pretty enough with the truth that she is the workmanship of God. You can be a part of that process with this free resource! With this Young Women Leader’s Guide, you’ll be equipped to walk alongside a teen girl – or group of teen girls – as she discovers how to be confident in who God has made her to be. Looking for a Leader’s Guide for Me, Myself, & Lies? Go deeper with women using the in-depth Bible study below. 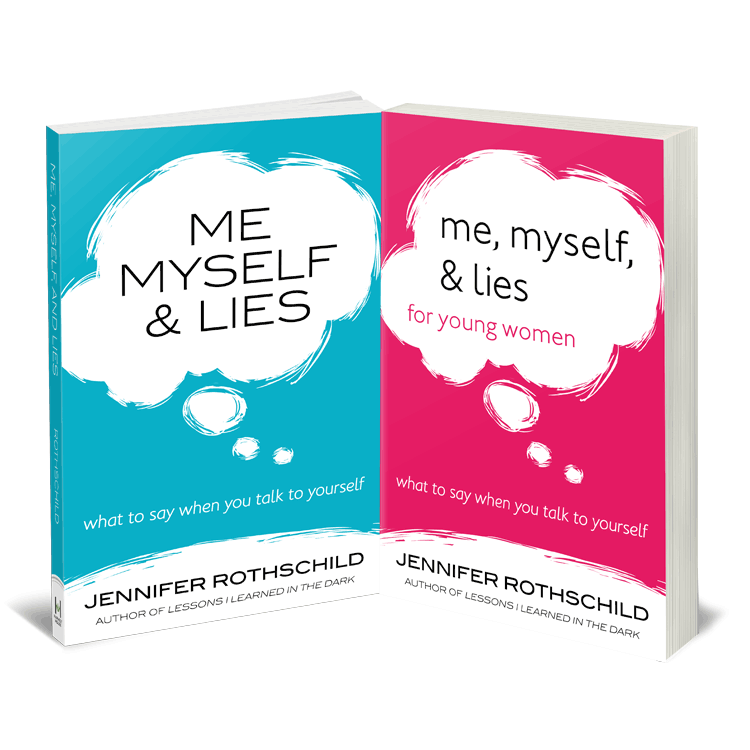 Join the more than 250,000 women who have gathered in small groups to explore in depth the principles of the Me, Myself & Lies book through this DVD-based Bible study with Jennifer Rothschild. In this six-week DVD-based Bible study for women, you will dive deeper into Scripture and walk through the practical steps to clean out the junk in your thoughts and replace these hidden negative thoughts and failures with positive truths from God’s Word. 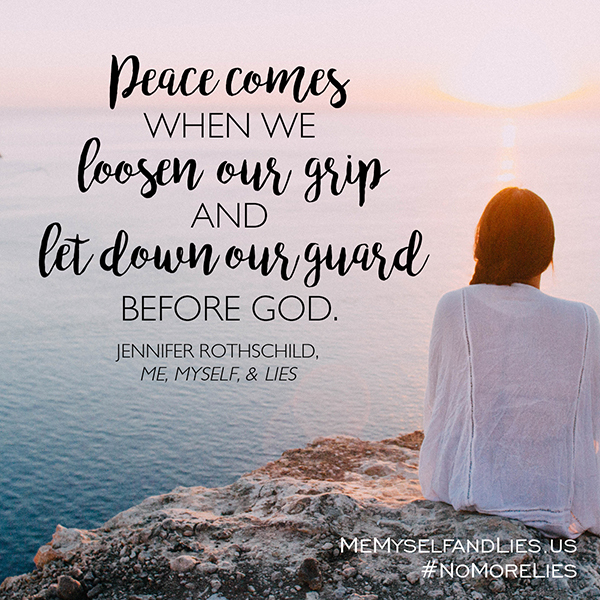 In this book, Jennifer strikes the perfect balance between sharing her own experiences and citing Scripture to awaken us to the possibilities of our own lives. 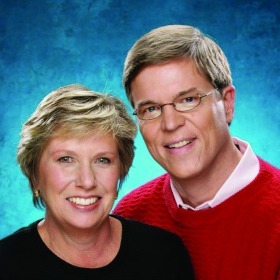 Jennifer has provided us with a reliable manual on how our words can bring life and health to the body, mind, and soul. 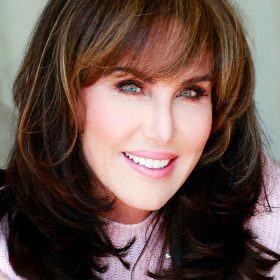 Full of wisdom and depth, Jennifer is never afraid to get personal and honest; she writes like the wise and trusted friend she is. This book is filled with warmth, humor, and though-provoking nourishment for our souls. We come away uplifted and satisfied. 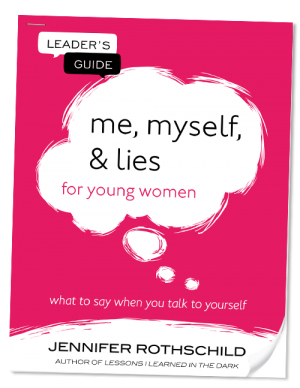 In this book, Jennifer offers freedom and confidence for those struggling with habitual negative, degrading, and painful self-talk. This invigorating book is a prescription for a renewal of joy and peace in a woman’s heart. She helps one to look inside the heart as the LORD instructs us to. We are to examine ourselves at all times. The writer aids one in such a loving fashion. Yet with encouragement and honesty to look deeper. She helps to bring understanding with no condemnation. When I am falling into that pit of despair and self pity, I know I have a place to go to find hope and inspiration. I would highly recommend this book to anyone, especially women who have been abused and suffer issues with self-esteem. This book is great and perfect for someone like me who gets bogged down in the negative self talk. 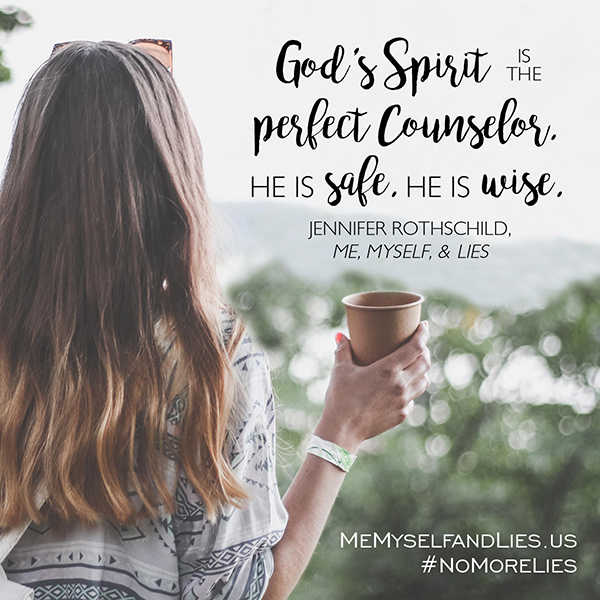 Jennifer does a great job of identifying the problems and offering scriptural solutions. Great book that speaks to my soul, and is a perfect small group study! This book has been so very helpful to me in managing my thoughts and how I view myself and situations that arise. I would recommend it to everyone. This book has changed my whole outlook on my daily walk; I never realized the moment to moment destruction of my soul that I did to myself. Jennifer has given me God’s word to place into my soul as a daughter of Christ. I can now stand tall and be proud of ME! I have spent so many years believing the lies people speak about me; it’s time to clean out the closet! To share these images on your own social media pages, right-click and select Save As. How is this book different from the Me, Myself, & Lies Bible Study? The book is designed for you to kick back with a cup of coffee and let Jennifer walk you through each chapter as you learn what to say when you talk to yourself. The DVD-based Bible study is designed for you to pull up a chair, get out your Bible and interactively walk through scripture. It offers daily reading and questions to answer while taking the concepts in the book deeper, digging into their biblical roots. For what age is the young women version book written? 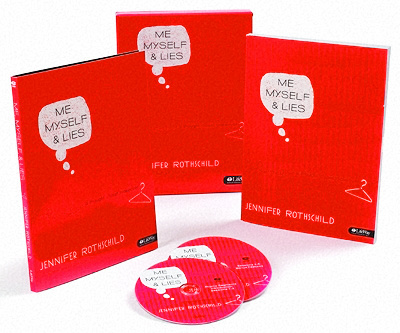 Me, Myself, & Lies for Young Women is written with the teen reader in mind (young woman between the ages of 12 and18). The content differs from the adult version as it is written for the the young lady who is getting through middle and high school, learning how powerful and important it is to train herself to speak truth to herself. If I bought the original Self Talk, Soul Talk book years ago, how is this updated Me, Myself, & Lies version different? The content you enjoyed in Self Talk, Soul Talk is still in the updated book but it has been enhanced and updated. 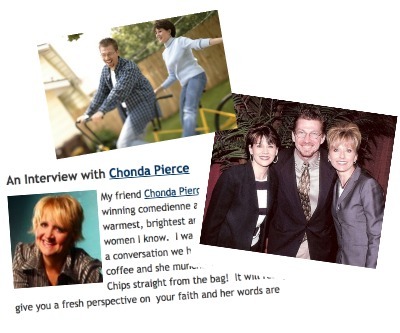 And, the very best part of Me, Myself, & Lies is the nine interviews with popular Christian authors, speakers and musicians. 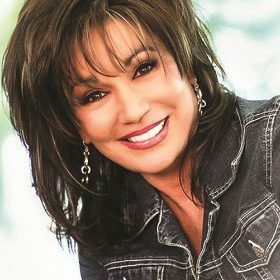 Lysa TerKeurst, Stormie Omartian, Laura Story, Chonda Pierce and others give you a sneak peek into their thought closets while offering practical encouragement and examples of what they say when they talk to themselves. Ben Laurro of Pure Publicity, Inc. at 818-753-4056 and Ben@purepublicity.com.